Both professionals and homeowners use flooring nailers to make their jobs and lives more comfortable and convenient. 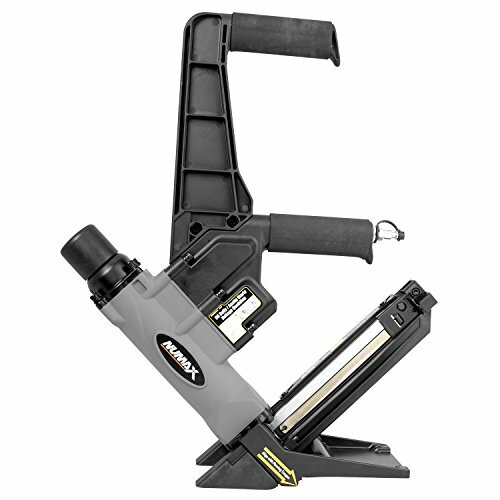 More importantly, the best flooring nailer models boost productivity and efficiency. They save time and do a lot better job than the hand nailing would do. These machines are somewhat easy to use and consume quite a lot of power since they can drive the nail deeply into the hardwood. However, we won’t be covering such nailers, but only pneumatic ones. 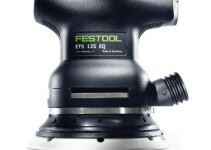 There is a huge market for flooring nailers, and buying the right product isn’t always a simple choice. Moreover, there are two types of flooring nailers (high and low velocity), and then there are subcategories to each of these categories. We will help explain those differences in our buyer’s guide. 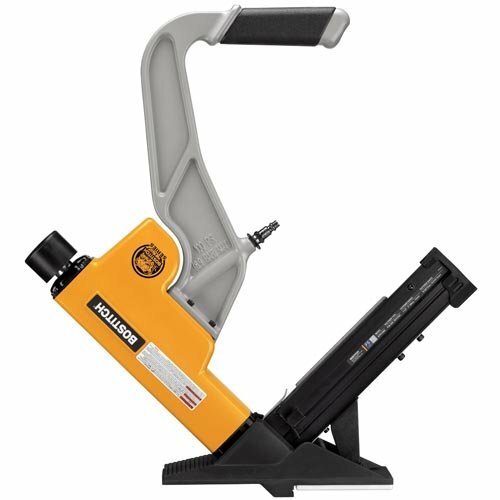 In this article, we will also go through 10 of the best flooring nailer options, describe their strengths and weaknesses, and explain why you should or shouldn’t obtain these machines. We will also explain technologies as we describe the nailers. We hope this article will help you learn more about flooring nailers, and why it is a guide idea to buy one instead of renting it. The flooring nailers save time and are easy to use. More importantly, they will significantly boost the worker’s productivity and efficiency. NuMax S50LSDH is a 2 in 1 nailer/stapler, featuring dual handling with a comfortable grip, allowing you to operate while standing or kneeling. 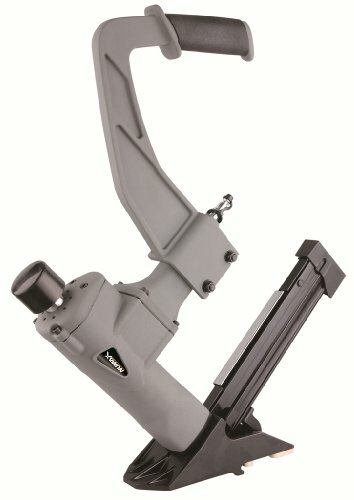 It features 2 in 1 magazine, allowing you to switch between L cleats (16 gauge) and staples (15.5 gauge) easily. It is air powered and fairly lightweight (7.3 lbs), made of quality aluminum. The S50LSDH is cost-effective, robust and highly durable. It has an anti-dust cap for easier maintenance, a light strike bumper for automatic and more comfortable fastener driving. It also has an integrated no-mar foot, which lowers the vibration and protects the already finished floor. This machine is suitable for both solid and engineered flooring (bamboo, groove or exotic). We recommend it if you are looking for the best flooring nailer that is lightweight, cost-effective and will pay for itself after you use it. The downside of this machine is the rounded stamped guide, so it may slip past the edge as you work. 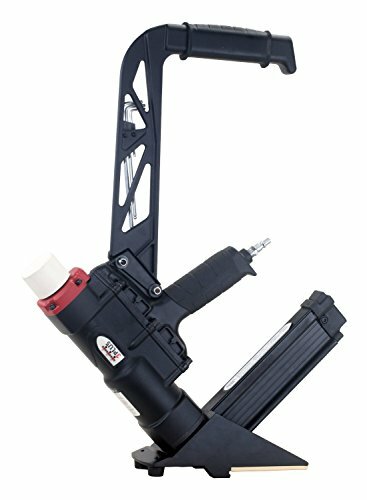 The HFSNSP is a pneumatic nailer that features 2 in 1 magazine, compatible with 16 gauge L cleats and 15.5 staples. It too features 2-handle system, though you can remove the second handle if you prefer working while kneeling. It comes with the mallet, which features white rubber finish for more comfortable use. It also helps with minimizing the vibration as you work. 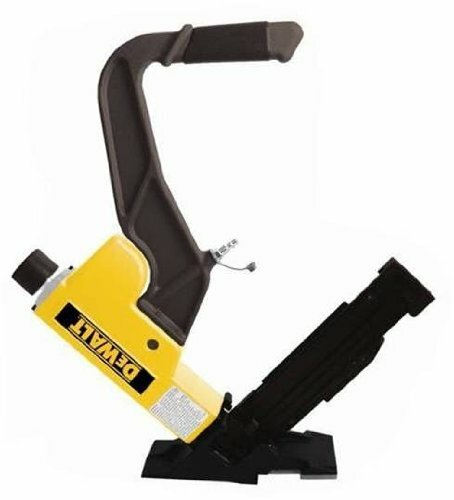 Both handles are padded, and we do commend the manufacturer for making ergonomically pneumatic nailer/stapler. Upon purchase, you will also receive flooring plates that will aid you in flooring. We recommend this machine to homeowners and contractors that are tired of renting the nailers. I love the ergonomic design and lightweight feel, which help a lot when you use the machine. Comfort saves you from frustration, and you don’t want frustration when you are doing the flooring. BOSTITCH EHF1838K is a flooring stapler, suitable for both solid and engineered hardwood. It features integrated adjustable knobs, so you don’t need to use any other adjustment tools. The grip is fantastic, ergonomically designed, entirely covered with firm rubber pad. The device is also safe to use, and manufacturers placed muffle in a way in which the air will exhaust away from the user. 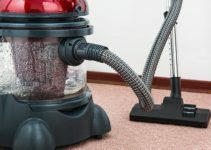 It has a no-mar trip to prevent the machine from damaging your floor and also help with the vibration. It is a perfect fit for hardwood as well as the engineered bamboo flooring due to the precise, eye-sight guide. It uses 18-gauge staples (one to 1.5 inch), the magazine being able to hold up to 100 staples. The product is easy to use, magazine easy to read. It is also worth mentioning that this best flooring nailer machine comes with a 7-year warranty. DEWALT DWFP12569 is pneumatic nailer and stapler, featuring 2 in 1 magazine for rapid exchange between the two (15.5 staples/16 clint nails). This nailer also features no marring base to prevent the damage, as well as give the user more control over the machine. The base is highly adjustable, granting you the ability to work with all-size flooring. Though we didn’t touch on this, every pneumatic nailer requires you to have an air compressor to power it up. Well, this nailer is very conservative when it comes to air usage, which is a good thing. It will perform rapidly without jamming. We commend the ergonomic design and lightweight but would like a bit wider base. Though it is highly adjustable, it could have been a bit bigger. It’s also worth noting that this nailer comes with the compatible mallet. PFL618BR Pneumatic Flooring Nailer is the most versatile nailer on our list, featuring 3 in 1 magazine, compatible with T and L cleats (16), as well as with staples (15.5). Moreover, this machine features two plates, one for Tounge and one for Groove flooring. PFL618BR also features no-mar base, which gives you more stability and prevents floor scratching. It comes with a mallet (wooden with rubber finish) and with Freeman case. This machine performs well with real hardwood, such as Maple or Oak, and it does the job without jamming. And if it does jump, the machine is simple to disassemble and unjam. Like other freeman nailers, the PFL618BR comes with 7-year warranty. It will last more than that if maintained properly, which makes it very cost-effective. The only problem we noticed was that the machine would jam if you use it excessively. Other than that, it will do an amazing job. 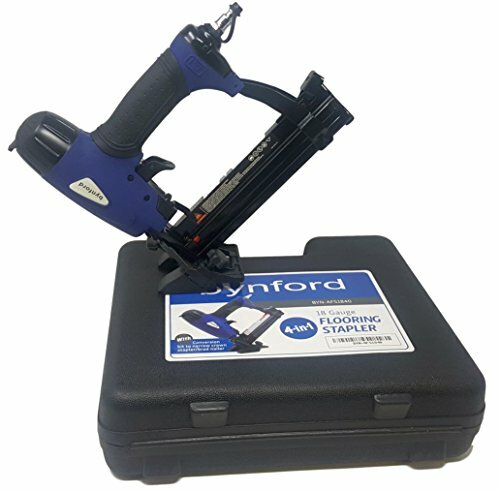 BYNFORD Hardwood Flooring Nailer features easily adjustable shoe, allowing you to operate on any floor thickness. It uses standard staples (18 gauge crown) and nails, also 18 gauge. This nailer is intended for both personal and professional use, comes with the carrying case, and is very efficient. Though it can work with hardwood, the manufacturer recommends using it for 9/16 floors. It is air powered and doesn’t require a great amount of air pressure to work. Though it is not intended for commercial use( it is somewhat expensive), it is certainly a better option to buy it than renting it. If you are a beginner, we can’t recommend this nailer, for it does require that you know a thing or two about nailers. Also, this specific nailer doesn’t use regular oil (you have to use a specific oil for maintenance). BOSTITCH managed to slip another product on our list, this time with its BTFP12569, a 2 in 1 nailer/stapler that uses standard cleats and staples. It features long, ergonomically designed handle for more comfortable, back-friendly operating. It comes with a high-quality mallet and 7-year warranty. This product features pneumatic driving action and is as such suitable for both hardwood and engineered flooring. Base plates are no-mar and highly adjustable, from 12.7 mm to 19.1 mm thick flooring. BOSTITCH BTFP12569 is a quality made a nailer and stapler, very lightweight (only 14.72 pounds), suitable for both commercial and professional use. We liked the design and use but noticed some flaws in feeding mechanism. After long use, the nailer might misfire, that is, it might miss the L cleats and fire blanks. Thankfully, this happened only once in 1000 times. This might have happened because of the air pressure, but some people have noticed the same problem. Other than that, it works flawlessly. NuMax SFL618 is a 3 in 1 pneumatic nailer, suitable for using staples and cleats (T and L), all standard sizes. It comes with one year warranty and a rubber mallet. NuMax SFL618 features an extended, padded handle that grants firm and comfortable grip. Speaking of comfort, it also features sensitive bumper, one that doesn’t require heavy strike to operate. The magazine can hold 120 units and give you the option to switch between the three units easily. Base plates are interchangeable, so you can adjust them according to your floor thickness. NuMax SFL618 works tirelessly and precisely, just as it is intended to do. We feel this nailer is suitable for homeowners and amateurs, but not for professionals. The bumper is very sensitive, which can be a good and a bad thing, for it will react to light mallet swings, so be aware of that if you decide to obtain this nailer. Freeman PFBC940 is a well made mini nailer, featuring light aluminum body and rubber O rings for maximum durability. The handle is solid, rubber padded, but not extended. Freeman PFBC940 features quick release system, which allows you to unjam it without any hassle, that is if it does jam. The magazine is dual, allowing you to switch between standard 18 gauge staples and nails. I liked this device, for it is very lightweight (only 4 pounds), and is a perfect fit for beginners and amateurs. This is a mini nailer, and we can’t recommend it to professionals. Freeman PFBC940 is ergonomically designed and is suitable for light work, not the heaviest types of jobs. This machine might jam a couple of times, but it does have a quick-release system for unjamming. We recommend it to DIY enthusiasts and homeowners. 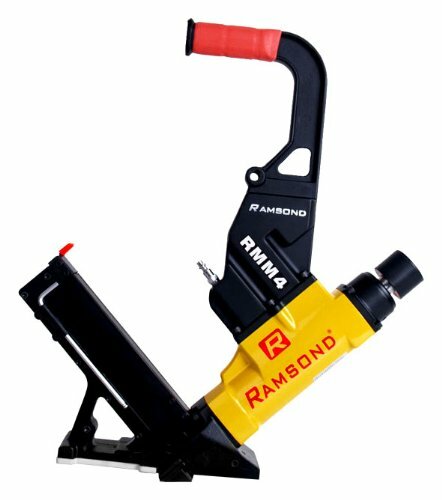 Ramsond RMM4 is a pneumatic 2 in 1 nailer and stapler, suitable for using both cleats and staples. It comes with a mallet and carrying case for extra comfort. What differs Ramsond RMM4 from other nailers are the integrated air chambers which allow it to store extra air and release it upon need efficiently. It also has the no-marring system, thus preventing any potential damage to your floor. We recommend it to both professionals and amateurs, but mainly professionals, due to its durability. This is a steel made nailer, with the mixture of die-cast alloy, so it is a bit heavy (26.9 pounds). It comes with two adjustable plates and can be used for any flooring, regardless of its thickness. However, it isn’t the most reliable nailer, and it will misfire a couple of nails. We also don’t recommend it to beginners. Firstly, we would like to say that all of the nailers/staplers we have presented here use air powering system. They are also mostly intended for DIY enthusiasts and homeowners. This guide will try and explain why you should buy the nailer, and which one is best for you. We feel that renting a nailer makes little to no sense at all. All the nailers on our list cost less than the renting would, and you get to keep the machine. However, we do understand that some people don’t want to have anything to do with DIY work, and will hire others to perform housework. This is all reasonable, but flooring isn’t the hardest thing in the world, and for that reason, we do suggest buying it. If you plan on using it, it is a smart investment that could potentially save you thousands of money. If you read the article carefully, these nailers differentiate in details. These details are small but small details matter in flooring. Here are several things you should have in mind while choosing the nailer. While reviewing the products, we’ve mentioned which are suited for professionals and which for amateurs. The main difference is in the usability. 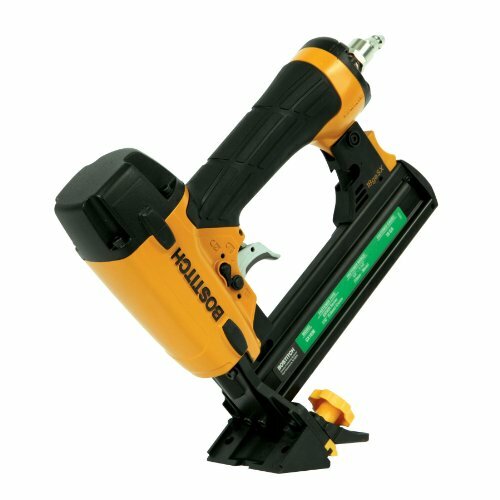 Professional/industrial nailers are harder to manage but grant the user more freedom and versatility. On the other hand, commercial nailers are simpler and easier to use but offer limited usability. Some of the nailers on our list are good for thicker, some for thinner flooring, and some are suitable for both thick and thin hardwood. Naturally, if you want the most versatile nailer, you will probably pay more for it. To avoid that, check your floor thickness and choose accordingly. Do you prefer bigger and heavier, or more compact and lightweight nailer? 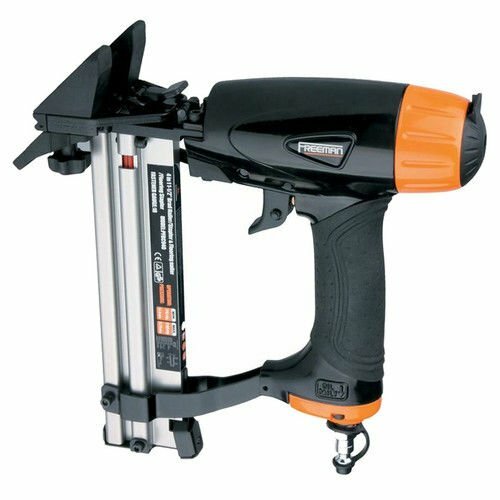 Industrial nailers are often heavier, but they are also more robust and very durable. Furthermore, some offer dual handling, with one short and one extended handle. This gives you the option to work while standing or kneeling. 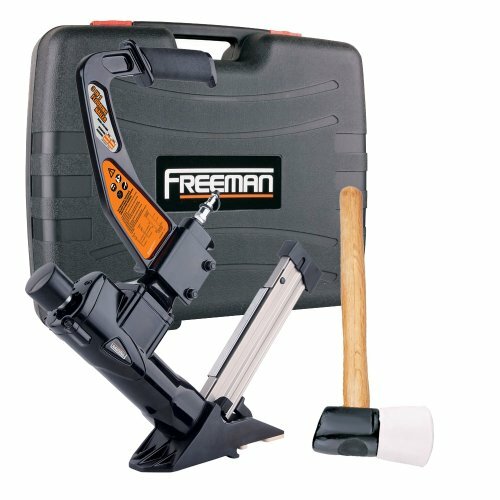 There is also the mini nailer (Freeman PFBC940), which is very lightweight but doesn’t have an extended handle. Also, if you plan on using both cleats and staples, the dual magazine would be the best choice, since it allows you to switch between the two very quickly. Pneumatic nailers are a smart investment and are better to buy one that to rent it. 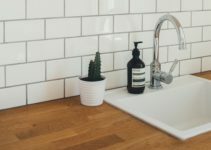 DIY enthusiasts are well aware of the fact that DIY flooring isn’t rocket science, and can save you thousands of dollars once you learn how to do it. If you are a beginner, go for the nailer that is easy to use, and if you are already knowledgeable about these things, choose the one that will help you make your floor functional and beautiful.